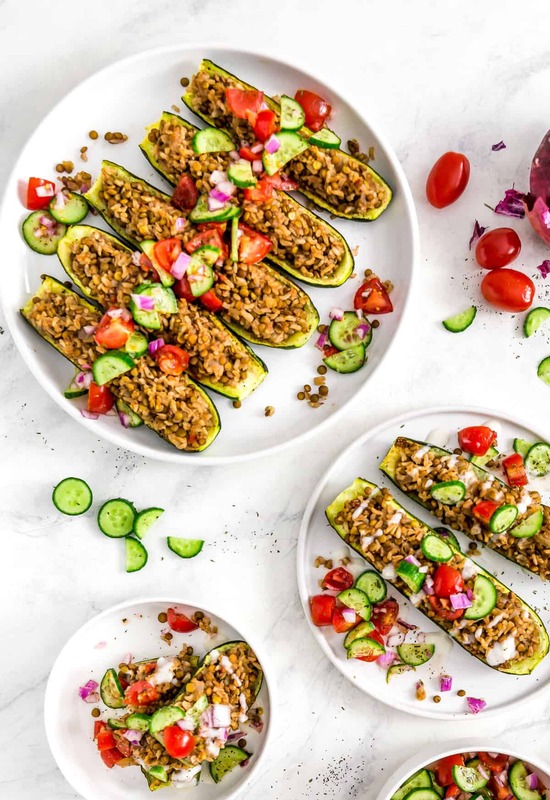 Full of flavor, stuffed with lentils and brown rice, these delicious Middle Eastern Stuffed Zucchini Boats are a new take on a classic Lebanese stuffed “koosa” (zucchini) dish. 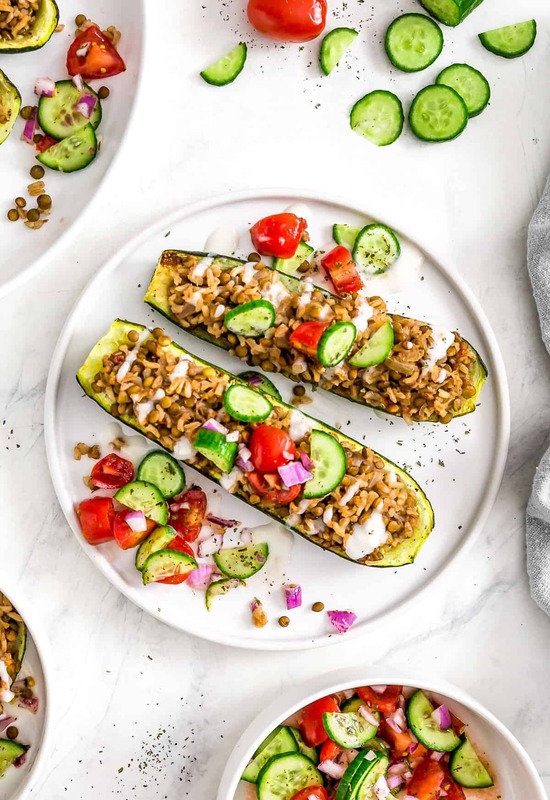 The inexpensive and humble zucchini is brimming with deliciously earthy-spiced rice and lentils, then topped with a refreshing veggie salad and a zingy garlic yogurt dressing that is sure to knock your socks off. 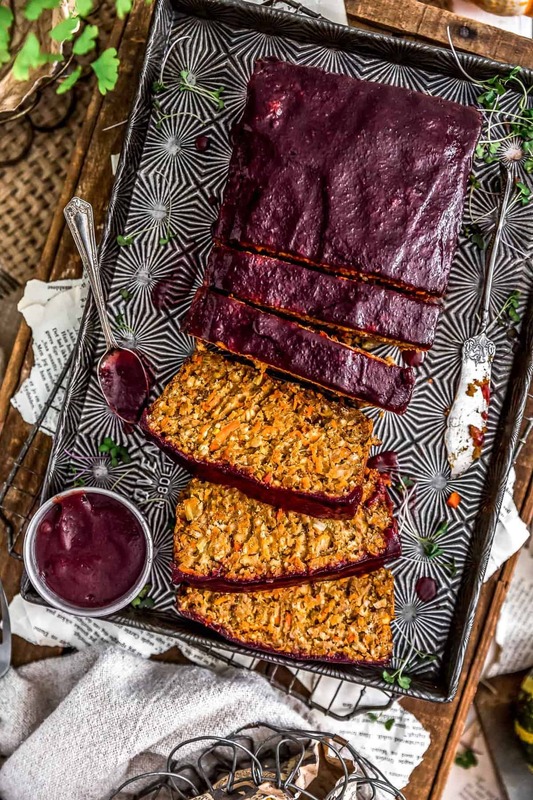 A fabulous Whole Food Plant Based recipe, vegan, oil free, sugar free, gluten free, no processed ingredients. I adore “Koosa mahshi” (stuffed zucchini). It is crazy delicious and sooooo gosh-darn yummy! Not sure if you are aware or not, but Middle Easterners take extreme pride in creating the most delicious food known to mankind, then they serve it with stunning over-the-top presentations. I am always amazing at the time and effort that goes into their food preparations. My husband’s family and friends go to great lengths, as well as, invest a significant amount of time when preparing food. Food is to be savored and presented with flair and finesse. It is not unusual to see family tables absolutely groaning with tons of different dishes, created with such care and creativity. It can be quite overwhelming at times just trying to decide what to eat from the vast array of gorgeous food options. 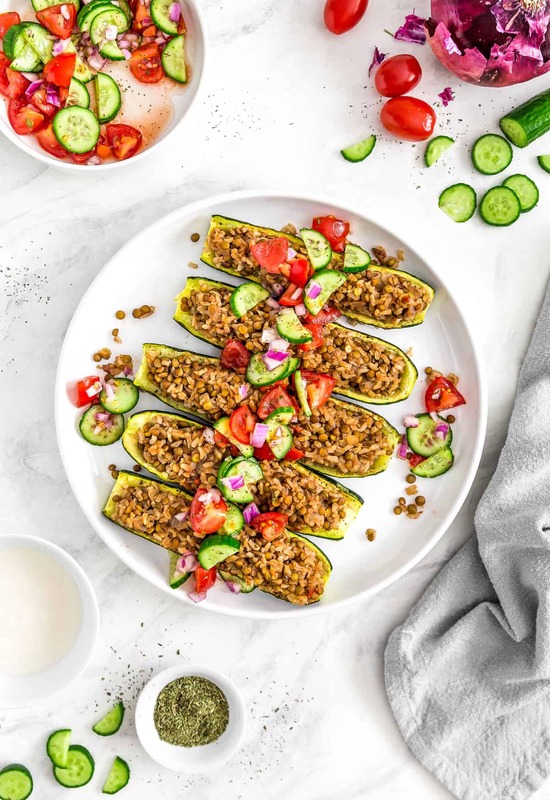 The zucchini is then typically filled with flavorful rice, beef, and spices and then cooked in a beautifully seasoned tomato broth until the zucchini is tender. It is crazy aromatic and divine. The kitchen is a virtual olfactory bonanza with your mouth watering in anticipation. 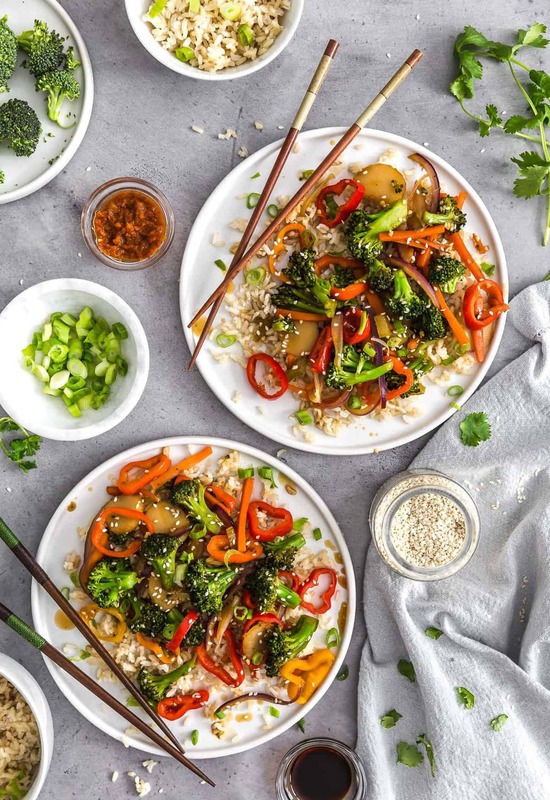 Since going WFPB, I think most of our Readers have seen that I’ve been on a mission to take all my husband’s family dishes and attempt to convert them to Whole Food Plant Based. 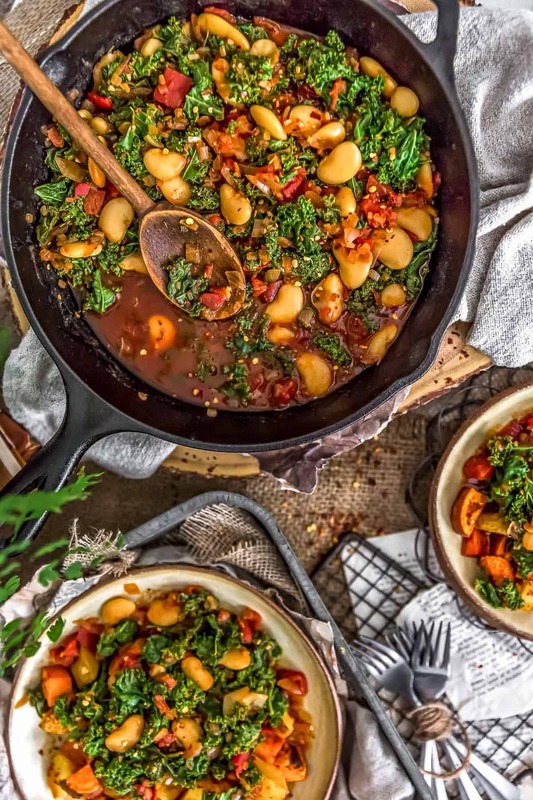 If you have been following our blog, then you have seen several of his family favorites converted to “Vegan Whole Food Plant Based No Oil” dishes already. My husband has been pleasantly surprised by how great the these WFPB conversion dishes taste without meat, processed foods, and no oil. 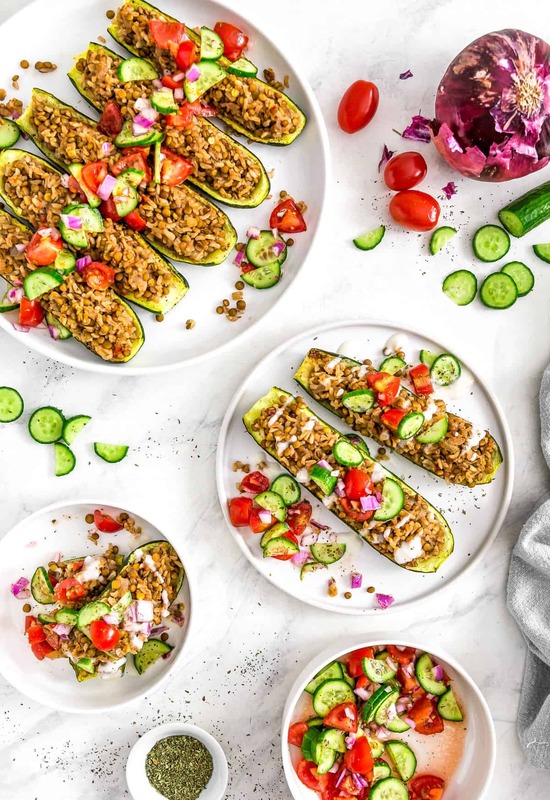 When I created this nod to the traditional Lebanese stuffed zucchini, I was really worried as Micho (Michael) does not like change, at all, not even a little bit -which sometimes can make things challenging. He likes things to stay the same, to feel the same, to taste the same. Sometimes, I think he is frozen in time. He adores tradition and loves all things Lebanese. Just to give you an idea, Michael is 33 and he still has and wears some of his high school clothes. I’ve tried to get him to give some of them up, but he insists on keeping them. He also still has pillow cases that he had when he was a child. I mean these pillow cases are thread-bare and literally falling apart. Some of them you can actually see through because they are so worn. He hangs onto them because they belonged to his mother. Micho tragically lost his beloved mother, Nezha (Nicki) when he was 14. Nezha was a beautiful, vibrant, loving woman, often the life of every party. She loved to dance and was always the last one off the dance floor according to Micho. She was a school teacher and loved by all who knew her. Keeping these old worn out pillow cases is Michael’s way of being with her every day. I carefully wash and dry his mother’s pillow cases so they will last for all of eternity. I wish I had had the honor and privilege of knowing her. When I presented this dish to Michael, he really wasn’t sure what to think because they didn’t look like traditional koosa, but he tried it, he loved it. YAY!!! He did request a more traditional look (hollowed out zucchini), but that is for another day, another recipe. LOL I am just thrilled he loved the zucchini boats. He really loved the spices and salad topper. I really think that all the elements of this dish make it work. The tasty salad combined with the garlicky yogurt really takes this dish to flavor town. I absolutely love it! I hope you give it a try and love it too! “You gonna eat that?” Typical TP109! His most famous words! He is always hungry. He will typically take a normal portion-sized amount of food to ensure that everyone gets a fair portion, but then it’s a free for all. Meaning since everyone got some food, seconds and thirds are fair game to him. I told him I would be happy to split it with him, which we did. He wanted everyone to know that this dish was “Finger licking good!” Which I found funny since you don’t use your fingers to eat this dish. HAH! We hope you give this delicious recipe a try! It is outstanding! 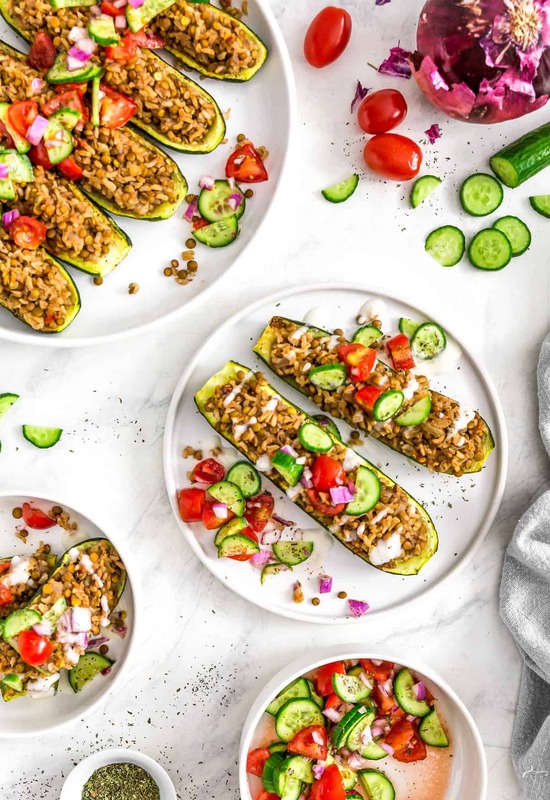 Full of flavor, stuffed with lentils and brown rice, these delicious Middle Eastern Stuffed Zucchini Boats are a new take on a Classic Lebanese stuffed “koosa” (zucchini). The inexpensive and humble zucchini is brimming with deliciously earthy-spiced rice and lentils, then topped with a refreshing veggie salad and a zingy garlic yogurt dressing that is sure to knock your socks off. A fabulous Whole Food Plant Based recipe, vegan, oil free, sugar free, gluten free, no processed ingredients. Cut off a tiny bit off both ends of the zucchini, then slice them in half lengthwise. Then take each zucchini half and dig a canal, remove the seeds to create a “canoe-type boat”. Make sure you do not remove too much of the zucchini as you want a nice canoe. When all 5 zucchinis have been prepared, you should have 10 zucchini boats. Place them on the parchment paper, cut side up, sprinkle each boat with sea salt and black pepper, then turn them up-side-down (cut-side down) onto the parchment paper. Place in a preheated 350 F oven and bake for 20 minutes. After 20 minutes, remove from the oven and set them aside until the stuffing is ready. In a large ceramic/enamel lined Dutch oven/pot or similarly large stockpot, add the diced onion. Sauté over medium-high heat for 5 to 7 minutes to soften them. Do not add a splash of water, you want them to turn golden brown. Keep them moving around the pan to avoid burning. Once the onions are softened and golden, then turn down the heat and add the minced garlic and sauté for 30 seconds. Next add the 3 cups of water and 1 cup of vegetable broth; then add the tomato paste and increase the heat to a boil, then lower to a simmer. Stir to incorporate the tomato paste into the broth/water mixture. Add the garlic powder, onion powder, cumin, coriander, sea salt, pepper, minced dried onion, and red pepper flake and stir to incorporate the seasonings. Add the lentils and cook uncovered for 15 minutes on medium heat. See recipe notes – cooking times vary by lentils used. After 15 minutes, then add the rice, stir once to incorporate, and simmer covered for another 20-25 minutes. See recipe notes on rice cooking times. After the additional 20 to 25 minutes has expired, check the rice and lentils to ensure they are both tender. Avoid stirring the mixture, you do not want the rice to release starches and become mushy. Stirring rice too often during the cooking phase causes the rice to become mushy. Once the lentils and rice are tender, and when all or most of the liquid has been be absorbed, it is done. You are now ready to stuff the zucchinis. Place a tiny amount of water onto the bottom of a 9 x 13 casserole dish. You are just wetting the bottom. There should be no standing water. This just prevents the zucchini skins from sticking to the bottom of the casserole pan. Lay the cooked/baked zucchini boats into your casserole pan, then fill each zucchini boat with the stuffing mixture. Once all the zucchinis are filled, press the filling down and add any additional leftover filling on top. It’s fine if the filing is piled high and overflows. Bake in a preheated 350 F oven for 20 minutes. 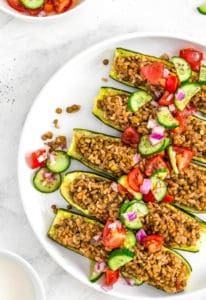 You are just looking to heat everything through since both the zucchini boats and lentil/rice mixture have already been cooked. Mix all the salad topper ingredients into a bowl and mix well. Chop the garlic on a cutting board, then add the sea salt on top of the garlic, and smash the together to form a garlic/sea salt paste, then add the paste to the yogurt mixture and whisk until incorporated. *Small Brown Lentils (Pardina/Spanish Brown): You can substitute any type of lentil for the brown lentils (other than red); however, you will need to adjust the cooking time. Small brown lentils typically cook faster than green lentils. ALSO see the notes on rice as you need to coordinate their tenderness timing with 10 minutes or so. We have found that the Small Brown Lentils works beautifully with this recipe. *Rice: The beauty of this recipe is you can substitute any type of rice you wish as well. The key is to find the best time to place both the lentils and rice (separately or together) into the pot so they are both tender at the same time, so adjust your times accordingly. If you are using a brown rice, then brown rice typically takes longer to cook than a white or basmati rice. Also, green lentils typically take longer to cook than the small brown lentils. If you are combining green lentils and brown rice, then you can add both the green lentils and brown rice at the same time and cook them with the cover on the pot to ensure they are both done at the same time or at least close to the same time. If you are nervous about the coordination of cooking times, then cook your lentils until tender and add cookedrice near the last 10 minutes or so of the cooking time. *Salad Topper and Yogurt Tahini Sauce: This dish is best when all the elements are combined. Sort of like if you are making pasta, you want the tomato sauce to make the dish complete; same concept here. The zucchini boats are best with the salad topper and yogurt tahini sauce. What type of lentils would you use if you want to use brown rice and cook in an Instant Pot? I cook the rice for 23 minutes. We haven’t made this dish in an instant pot before. Typically when we use brown lentils in an instant pot, it takes around 14-15 minutes on high pressure. However, I’m not sure how well brown rice and lentils would work together in the instant pot for this particular recipe. You could try cooking them together; however, it is possible that the lentils may get mushy by the time the rice is done cooking. If you try it, let us know how it goes.